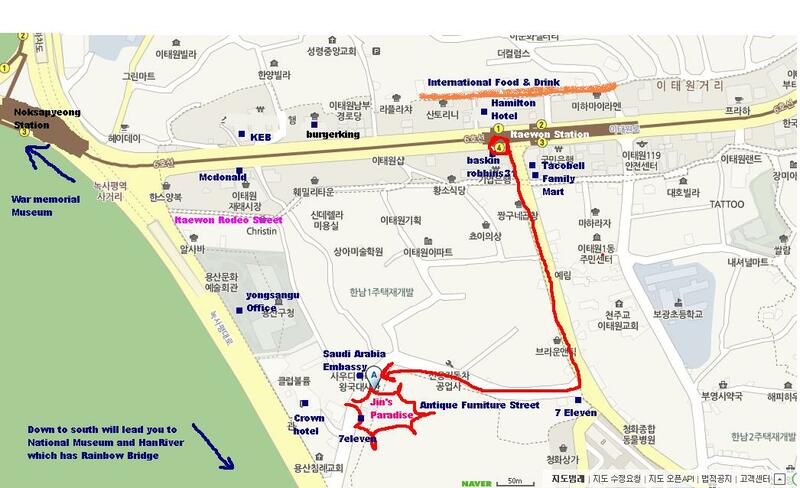 Address : 7th Floor, 36-18, Itaewon dong, Yongsan gu, Seoul, South Korea. 3. Get off at Itaewon station and Exit number 4. 4. Take exit 4 then make a U-turn to the left and take the first right towards ‘tacobell’. 6. Turn right at the light (there is 7Eleven across the street) continue on the furniture row, it is a downhill, steep road, the hostel is at the end of the furniture street left hand side of the road after a bend. 7.Try to find the sign out side of the building or the 7th floor building is the one! keep following the road, cross to other side at the lights and keep walking down, you will see wooribank and crown hotel on your leftside, and after there is a corner, make a left turn when you se the ‘shuen’ restaurant, keep walking till you see the seven eleven( about 1 min from shuen), the hostel is 20m just after the 7eleven! 1.Get on 10B airportbus terminal . 2.Get on bus number #6030. get off at ‘crown hotel‘. *From crown Hotel – Walking down the road (downhill) and turn left at the corner of ‘Shuen’ Restaurant. The hostel is 20m after 7eleven on your right. Try to find the blue sign out side of the building or find the 7th floor building next to the 7 eleven. We are on 7th building, on 7th floor!